Swans fans will be housed on one side of the Jimmy Sirrel Stand, which runs along the side of the pitch. The usual allocation for away fans is 1,300 but this is sometimes increased for cup fixtures. There is plenty of room on the concourse and the view from the stand is good. There is a well organised queuing system for refreshments, with alcohol and the usual variety of reasonably priced food available. Nottinghamshire is home to the legendary outlaw Robin Hood and the city offers a diverse and dynamic culture for visitors to enjoy – little wonder then why Nottingham is considered as one of the UK’s top destinations. For those who like a spot of culture on their away day football weekend, make sure you check out the Nottingham Castle Museum and art gallery. If you are making a weekend of it, then be sure to enjoy the wide variety trendy bars in the ‘Hockley’ and ‘Lace Market’ areas of the city. Foodies will also love the fact that Nottingham is known for having more international cuisine restaurants than any city outside of London! Whether it be Noodle Bars, Mexican, Portuguese, Brazilian, Cantonese or Italian in the ‘Chapel Quarter’ of the city centre. There are plenty of hotels – to suit all budgets – to choose from as well, including Premier Inn, Travelodge and Jurys. The stadium itself is located around 15 minutes from the city centre so you will be spoilt for choice in terms of a pre or post match tipple. 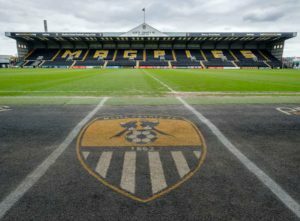 Notts County is the oldest league club in the world, so why not enjoy your pre/post match food and drink at ‘Ye Olde Trip to Jerusalem’ – which is rumoured to be England’s oldest Inn dating back to the 1100s. On exiting Nottingham railway station, turn right. Turn left at the top of the road and take the 2nd right into Castle Road. The pub is on the left. There is a Wetherspoons in the Waterfront complex – which is a short walk from the train station. As you come out of the station turn right and cross over to the other side of the road (As you cross the bridge going over the canal you can see the complex). At the top of the road turn left and the Waterfront complex is just down on the left. You don’t get many pubs that have a canal running through them, so a visit to the Canalhouse on Canal Street is a must! The pub is around a 20 minute walk from the stadium. One venue very popular with male football fans is Hooters Nottingham, which is situated on the main A6011 road and is only a 10 minute walk from Meadow Lane. As you’d imagine it very popular on match day so it is advisable to pre-book a table – which can be done online or by telephone (0115 958 8111) if the booking is for 6 or more people. There are three car parks at the stadium (Derek Pavis, Iremonger Road and Meadow Lane) which all operate on a first come first served basis. The roads around the vicinity of Meadow Lane are all subject to parking restrictions on match day. The ground is a 10-15 minute walk away from the main Nottingham Railway Station. As you come out of the main station entrance, turn left from the station across the car park and then turn right at the traffic lights. The ground is about a 1/4 of a mile down the dual carriageway on the left. Trains leave Swansea at 06:29, 07:11, 07:59 and 09:42 for the 4.5 hour trip. The train back is at 18:10 or 19:10 getting into Swansea at 22:44 or 23:53 respectively.